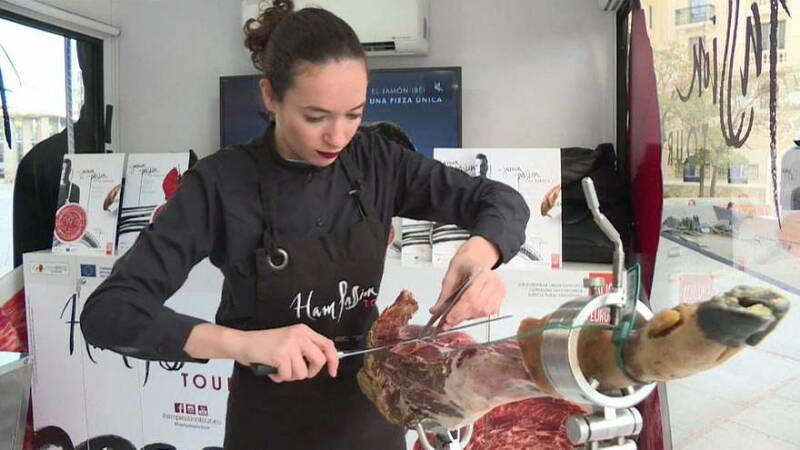 Spain's traditional art of ham cutting is a prestigious and lucrative career. The country's world-famous dry-cured ham legs can fetch up to €3,000 and top carvers are sought after for upscale restaurants and special events. "It was a job traditionally for men," explains carver Raquel Acosta. "The normal thing was to see a male jamon carver. In fact, jamon carver as a feminine word (in Spanish) was something you never heard. If you looked for it in Google, what appeared were machines for cutting ham not a person." Acosta's career took off after she started to appear in jamon carving contests. "It was bit like a 'boom' because most of the girls that did this task of cutting Spanish ham always did it in places where they were not so much seen, like in specialist butchers or supermarkets." Learning the correct way to slice a leg of ham takes months -- and years of apprenticeship to perfect. Master carvers learn how to weild six different knives and how to follow the natural curve of the meat to produce paper-thin slices of the same size and thickness. Now there's one more thing to learn: the word 'cortadora,' meaning female jamon carver.